Every fall, I have a landscaper dump a whole truckload of leaves vacuumed up from various properties at my holding area for such things. Rain and snow drench the pile in the coming months, starting it on the road to decomposition. When sufficiently warm weather has decided to stay in spring, I scoop out a few holes in the pile, fill them with compost, then tuck in watermelon transplants. Last fall’s pile yielded well from summer until early fall this year, at which time I gathered up remaining melons for eating or, if unripe, for composting along with the vines. The tractor, with its bucket, was able to move and compact the now dense pile to make way for this year’s crop of leaves. 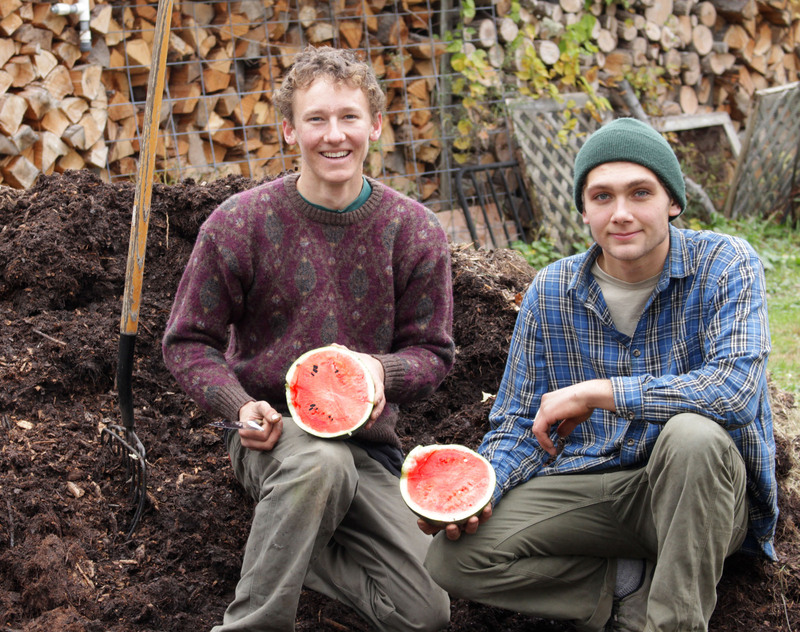 Ben & Jeremy show off the November watermelon. Now we’re up to November 1st, time to spread the leaf mold before it freezes — a big job that necessitated enlisting the help of my neighbors Jeremy and Ben. We were loading and hauling and loading and hauling, forking deeper and deeper into the bowels of the pile, when Jeremy yelled that he’d just speared a watermelon I had overlooked when cleaning up. I cleaned it off and sliced it open. It proved to be a ripe watermelon. The taste? “Awesome,” to quote Jeremy. Okay, I admit to not being able to claim too much credit for the ripe watermelon. How did it get there? Was it ripe and overlooked, then buried and preserved in the warm bowels of the leaf mold pile? Was it unripe when buried, then subsequently ripened? Probably not. No leaves were poking out of the pile, capturing the sun’s albeit weak rays for photosynthesis to make the sugars needed for ripening. A couple of nights of 25°F would have done in the leaves anyway. This burst in ethylene production occurs even after climacteric fruits have been harvested, as long as they were sufficiently mature at the time. You can’t pick a golfball-sized green apple and expect it to ripen off the plant. Non-climacteric fruits lack that pre-ripening spike in respiration and ethylene production, and do not ripen after harvest. Or so the thinking, based on early experiments, went. According to more recent research, fruits show various degrees of ethylene production. Watermelon is not a climacteric fruit, but at a certain point the white flesh within does release a burst of ethylene some time after which it morphs from bland and unripe to sweet, red, and ripe. But that won’t happen off the vine. So my watermelon must have been overlooked and ripe and evidently kept perfectly well in the moist warmth of the leaf pile. Ethylene, and not me, is going to take credit for the fresh, sweet red peppers in today’s salad. Peppers are a climacteric fruit. Green peppers are unripe peppers, but if the fruits have just a hint of red on them, they can ripen even after harvest to full red (or yellow, orange, or purple, depending on the variety of pepper) color and, at least to my taste buds, flavor. Still eating fresh, red, ripe sweet, juicy, delicious peppers. Skill is needed to ripen peppers off the plant. Cool, but not too cool, temperatures hold the fruits for storage and warmer temperatures then speed ripening. Just the right amount of humidity is also needed to, on the one hand, avoid drying, or, on the other hand, rotting. My wife, Deb, rather than I, plies these skills, so should probably get credit for the ripe, red peppers. This season has been the best pepper season ever, both in quantity and in quality. King of the North peppers, large and blocky, with thick, juicy walls, now ripening in a basket taste as bland now as they did all summer. I won’t grow them again. 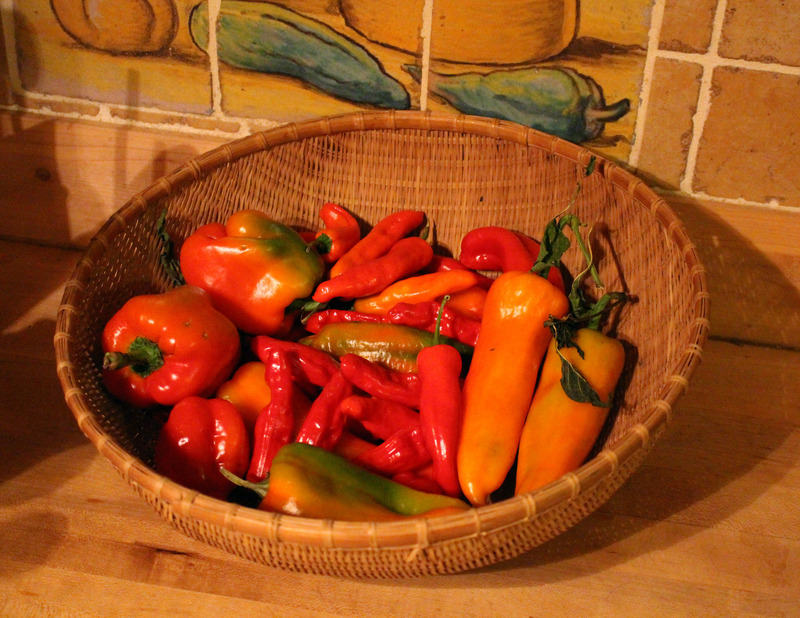 In contrast, Carmen, Sweet Italia, and (slightly hot) Pepperocini peppers, also ripening in that basket, taste as good now as their siblings did snapped from plants basking in summer heat and sun a few months ago. This entry was posted in Fruit, Gardening, Soil, Vegetables and tagged climacteric, ethylene, leaf mold, leaves, mulch, pepper, ripening, watermelon. Bookmark the permalink. Trackbacks are closed, but you can post a comment. Do you by any chance write your posts ahead of time because I live South of you I believe and everything froze solid here. It even looks like the brussels sprouts that I normally harvest around Thanksgiving or later have died. What a great gardening tale! That is the proof of your “awesome” gardening abilities – you have tales to tell. And what a great way to reward your neighbors for their help. Thanks Lee for educating me about Climacteric and Non-climacteric fruits. Best post ever. Even though I grew up on a small orchard and berry farm in Missouri I was not aware of that term. Retired in Florida now but still but still remember biting into a juicy tree ripened peach and having that sweet flavor running down your chin. Love your farmden.